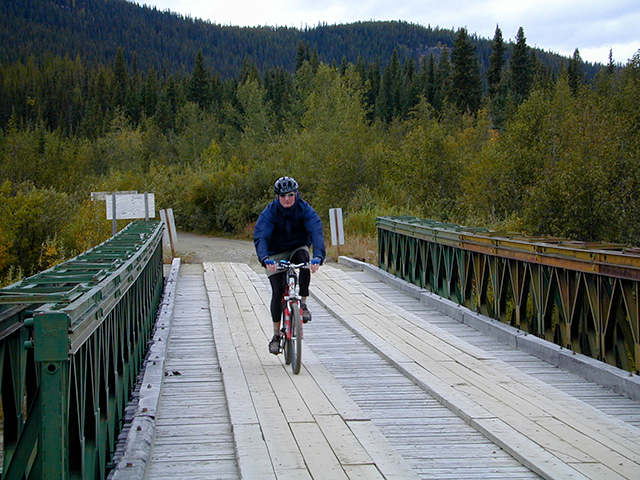 Venture by bike to the northern fringe of the Rocky Mountains in the remote Northeast Yukon! 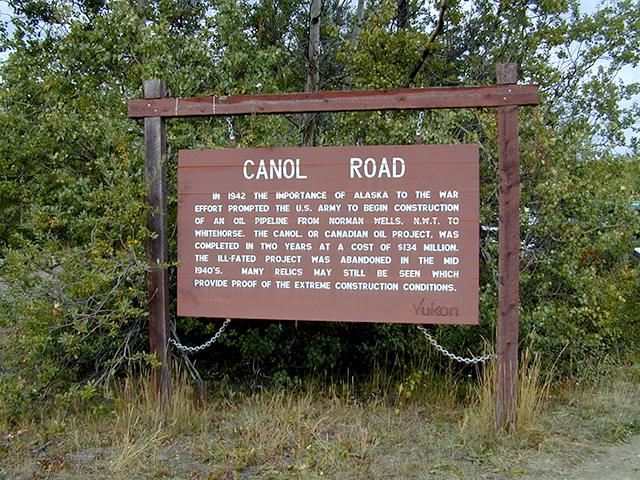 The Canol Road takes you through some of the most isolated and beautiful territory in North America. 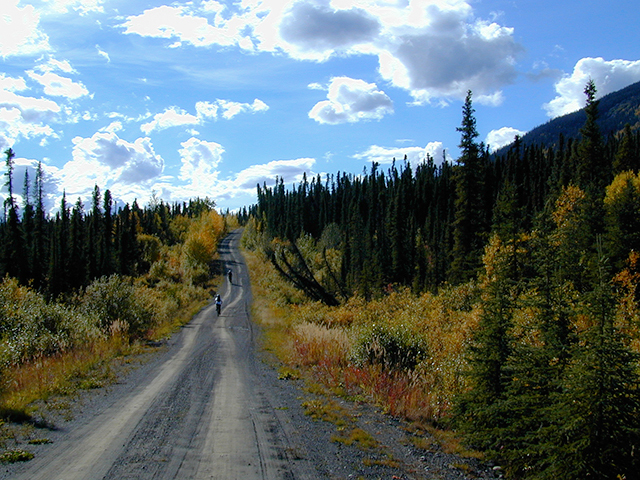 Ride on a historic WW II pipeline access road to the border of the Northwest Territories. 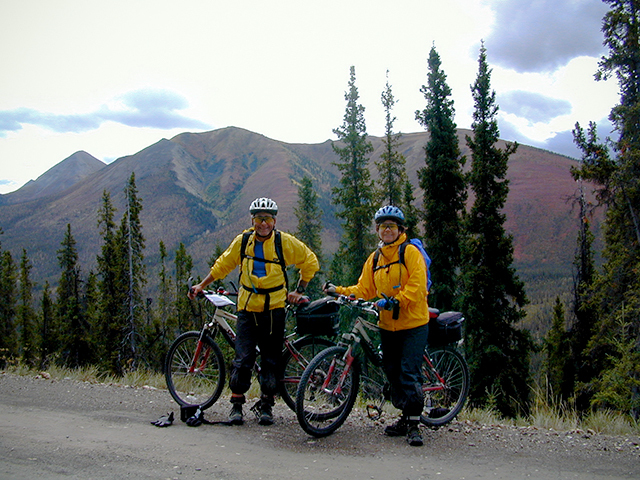 Cycle through a remote region of North America to the edge of the Rocky Mountains in Canada's Yukon Territory! 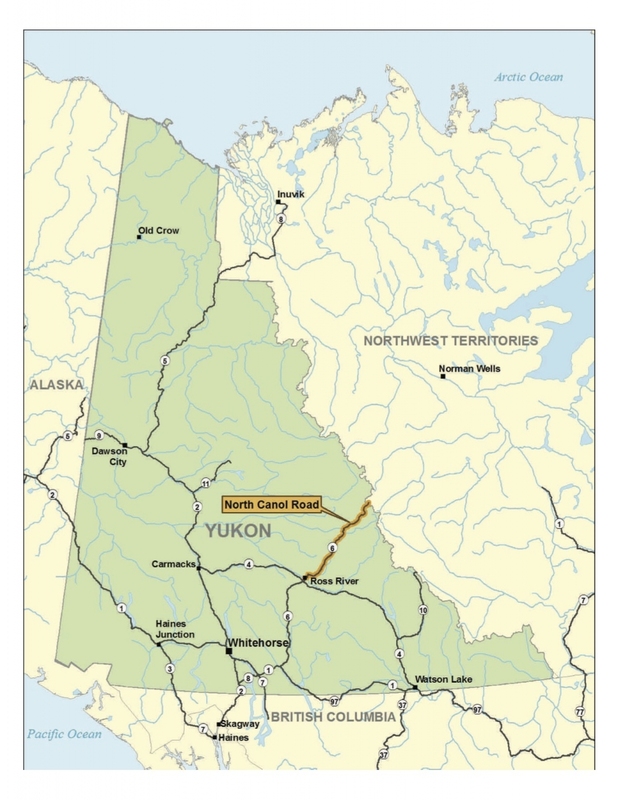 During WW II the US army constructed a road to bring oil from the Mackenzie River in Northwest Territory to a refinery in Whitehorse. Two years after completion the 176 million dollar project was abandoned. 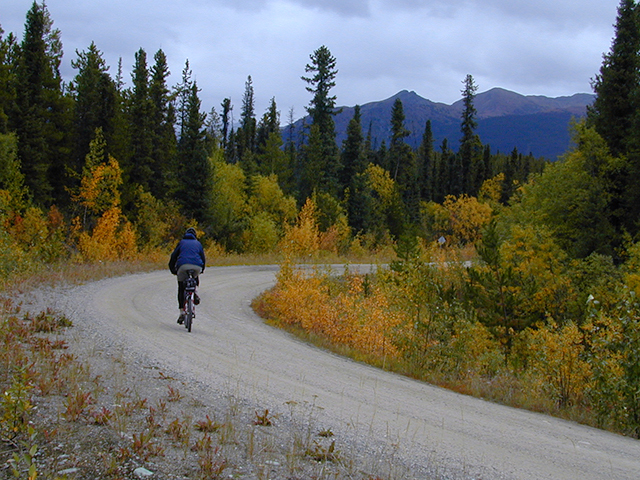 The dirt road is still seasonally maintained by the Canadian government. The winding route takes you through some of the most beautiful northern country in this hemisphere. Bike past pristine lakes with loons calling. Observe relics of the road's WW II past. View the scenic splendor of the autumn colors in vibrant reds and golds. Watch the northern lights put on a show while a wolf howls in the distance. Your journey starts in Whitehorse Yukon, Canada for travel by van to the Village of Ross River, YT and the start of the North Canol Road. After a night spent at the YTG campground, you continue by van up the North Canol to the sub alpine splendor near Macmillan Pass. You spend an extra day exploring the area from our base camp, then head south on your bike back to Ross River and onto the South Canol Road to Johnson's Crossing. 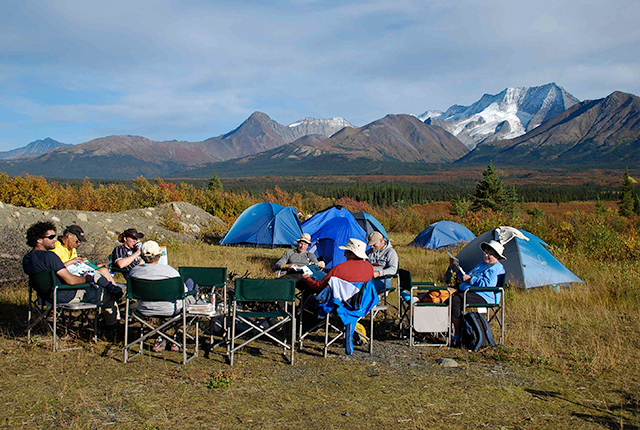 This tour is fully supported and consists primarily of comfortable wilderness camping. Camping is the only option for exploring this part of the world but that does not mean a lack of comfort, (See our camping experience). You dine on Alaskan specialties like grilled sockeye salmon and halibut curry. You are provided with a senior local guide who informs you about the region and takes care of your needs. This tour is a true northern adventure and wilderness experience! Enjoy an intimate touring environment. 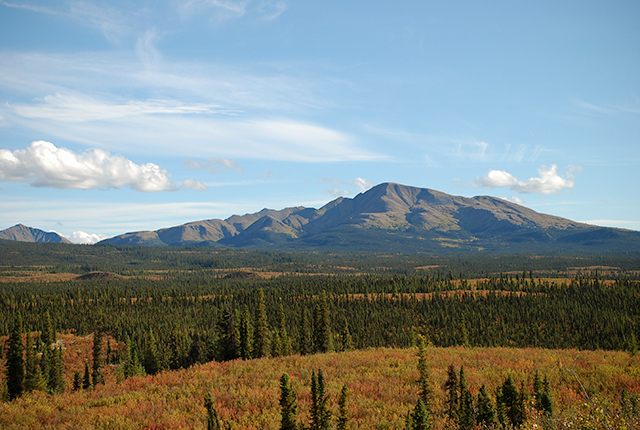 Experience the pristine wilderness of Northern Canada. Autumn colors and cool nights with Northern lights! Our most remote tour in a seldom visited region of North America. Notes: Price includes a mountain bike, helmet, camping gear, lodging, and meals from day 1 lunch through day 10 breakfast. Participants must be confident riding a bicycle with hand brakes. Helmets are required. A passport and other necessary immigration documents are required for this tour. For information about travel to Alaska and recommended gear see our trip preparation link. Day 1 - You meet your group and guide in Whitehorse YT Canada in the morning. 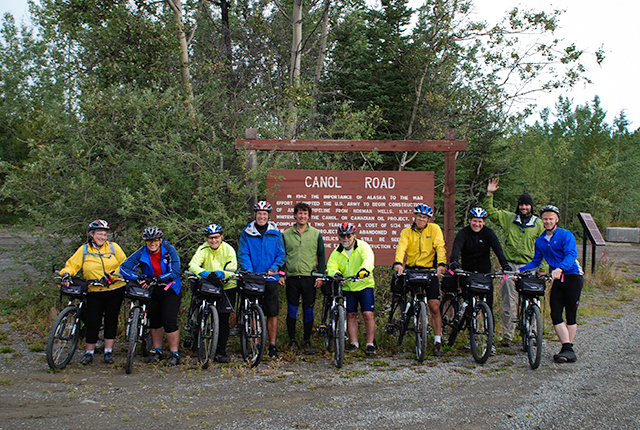 After an orientation and bike fitting the van heads north on the Klondike and Campbell Highways to Ross River. You spend the night at a YTG campground . 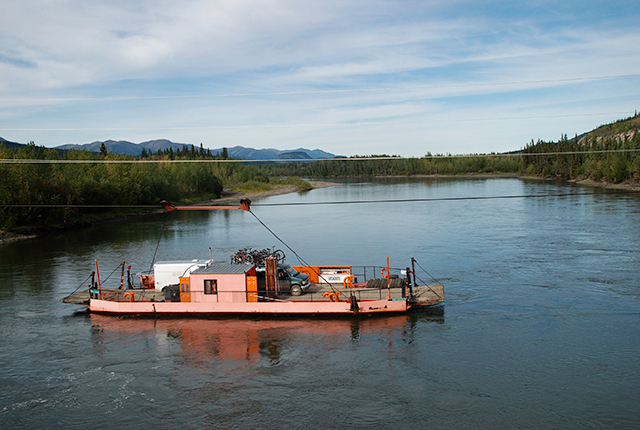 Day 2 - You board the Pelly River ferry and cross with the van to the opposite shore where the North Canol Road begins. 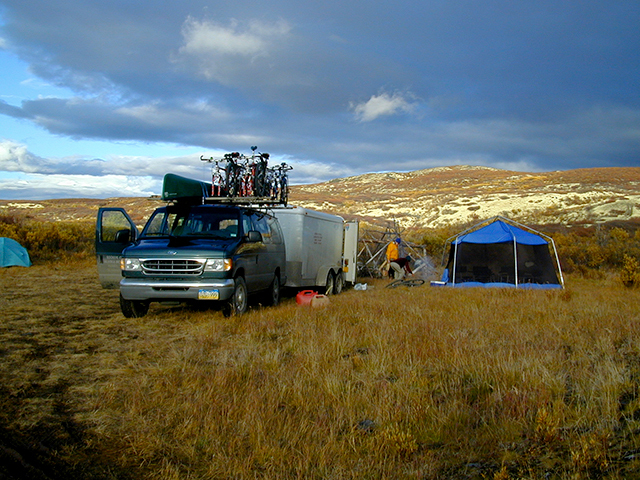 You shuttle by van up the road and camp with a view of the Itsi Mountains, the Northern end of the Rockies. 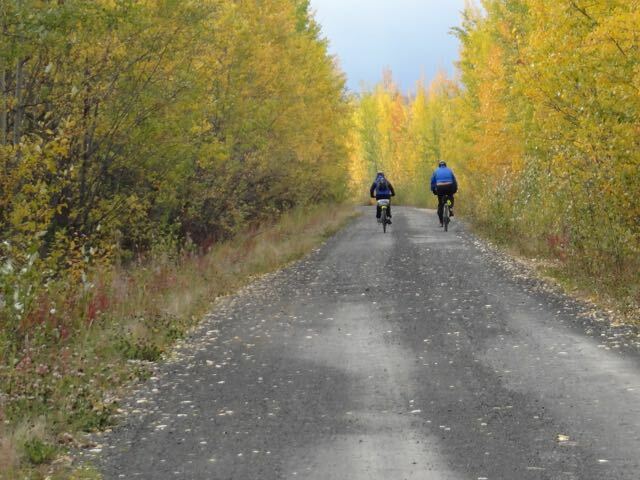 Day 3 - Today is spent exploring the area by bike and relaxing in camp while enjoying the beautiful scenery and fall colors. 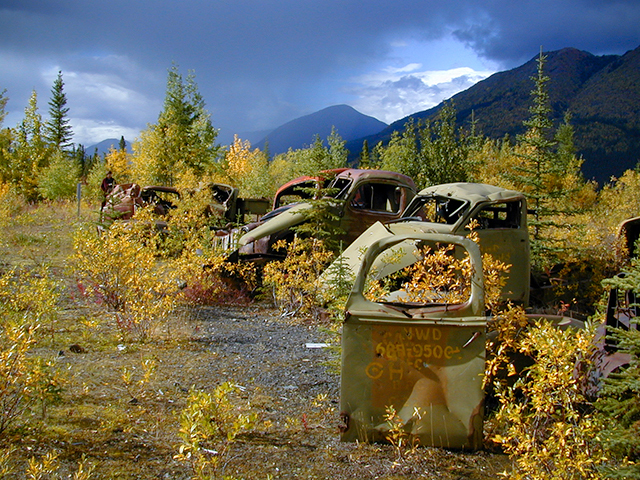 The van shuttles bikers to the NWT border for the ride back to camp, rusty vehicle relics from the WW II era line the road, 30 miles. Day 4 - You follow the river then climb over a ridge. The road traverses the remains of an old forest fire that swept through the region. Fireweed lines the way as you leave the Continental Divide behind. You camp by a Lake, 35 miles. Day 5 - You continue your southerly ride coasting down and pedaling up short hills. You spend the night at a quaint camp overlooking a small lake. The fire is warm and comforting as another splendid meal is prepared for you, 50 miles. 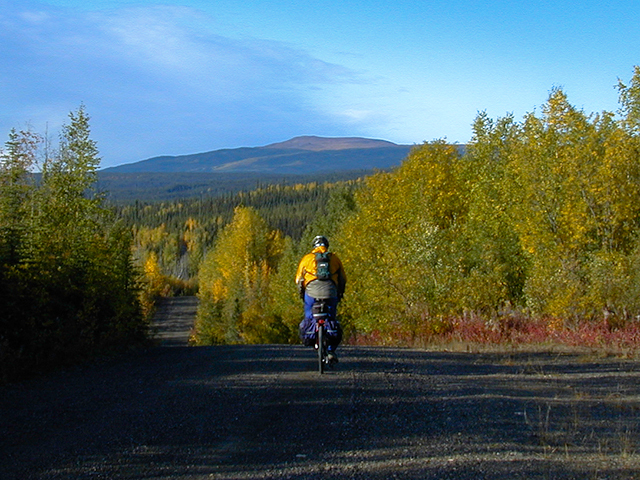 Day 6 - The last day of riding on the North Canol Road returns you to to Ross River and a hot shower. You can bike to camp or shuttle in the van from town to the YTG campground at Lapie Canyon, 35 miles. Day 7 - The route ascends from the Lapie River Canyon to the start of the South Canol Road. You turn right off the Campbell Highway and pedal your way south to the Pelly Mountains and camp by a lake, 40 miles. 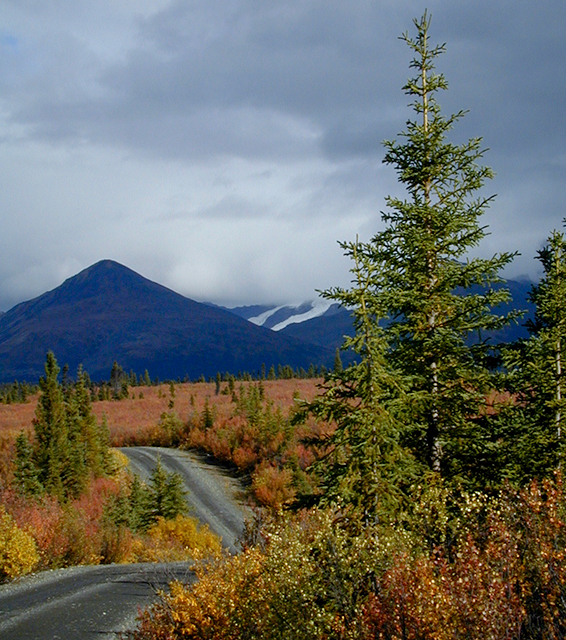 Day 8 - Black spruce and willow line the road as you skirt by small lakes and rivers heading into the Pelly Mountains. The quiet and solitude of this country prevails. The night is spent camping on the shore of Quiet Lake. Sitting by the fire brings Robert Service prose to life, 55 miles. Day 9 - You hop on the bikes for your last day of riding as you descend to Johnson's Crossing and a warm shower at the local motel, 47 miles. Day 10 - After breakfast the van heads to Whitehorse. 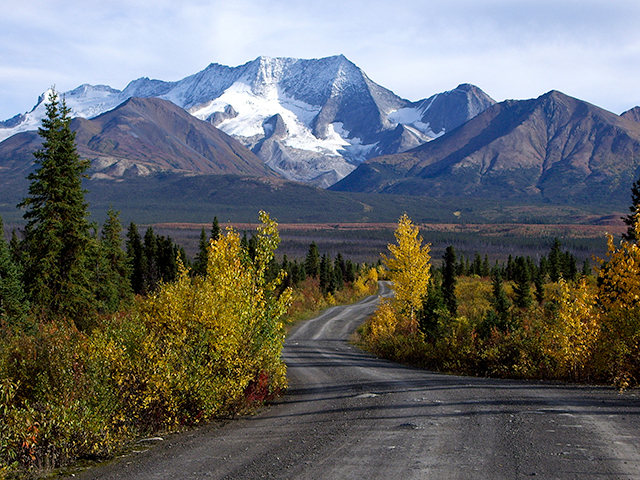 You reflect on your Yukon adventure and enjoy the beautiful scenery along the way. 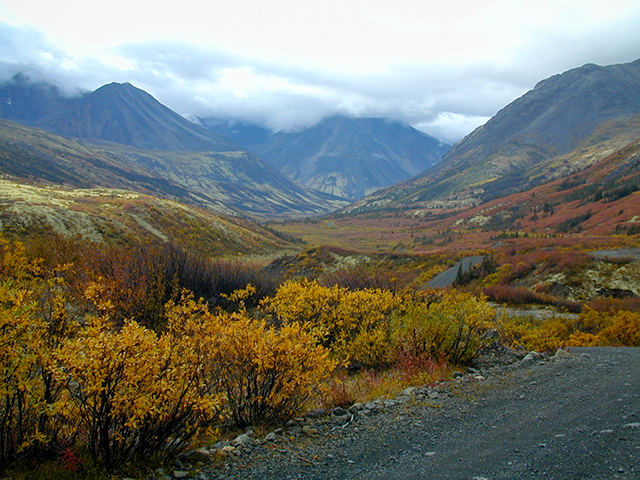 You can fly south that afternoon or make a hotel reservation for the night and extend your adventure in the Yukon. Besides camping, guests will stay in a motel in Johnson's Crossing. Visit our camping experience to learn more.